Mumbai: The new Reserve Bank of India (RBI) governor, Shaktikanta Das, used his first day in office on Wednesday to immediately change his predecessor’s style of functioning. 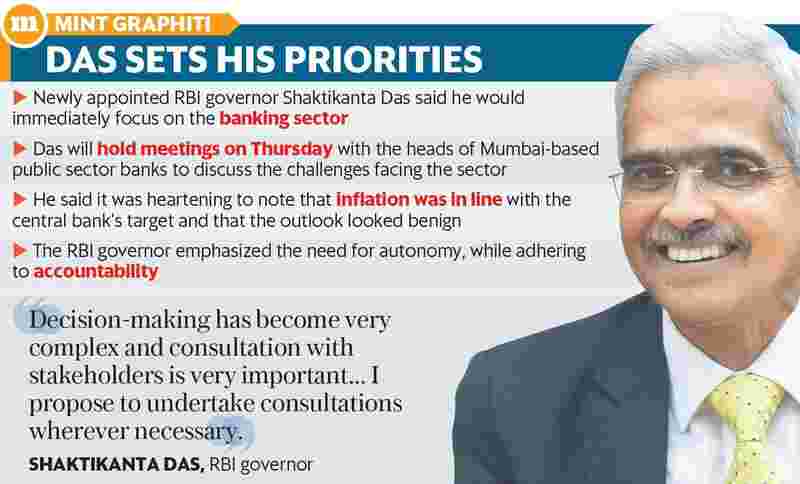 Assuming charge as RBI’s 25th governor, Das said he would take a more consultative approach and move quickly to address some of the pressing issues. He also emphasized the need for dialogue with all stakeholders, a clear shift from his predecessor Urjit Patel, who was considered reticent and rigid. “Decision-making has become very complex and consultation with stakeholders is very important. Consultation with stakeholders adds value to our understanding of issues. It adds depth to our understanding of issues. I propose to undertake consultations wherever necessary," Das told reporters at a press conference in Mumbai. To begin with, Das has called for a meeting with the heads of Mumbai-based public sector banks on Thursday, his second day in office, to discuss the challenges facing the banking sector. “Banking is an important segment of our economy and it’s facing several challenges, which are of critical importance. I would like to focus on banking sector immediately," he said. Commenting on the relationship between RBI and the government, which has hit rock bottom, Das said that dialogue with the government is necessary. “I wouldn’t go into issues between RBI and government, but every institution has to maintain its autonomy and also adhere to accountability," he said, adding, “I don’t know if the relationship is good or not but we have to have stakeholder consultation. Government is not just a stakeholder but also runs the country, economy and manages major policy decisions. So, there has to be discussion between government and RBI." Das confirmed that the board meeting scheduled for 14 December would go ahead as planned. The board is likely to continue discussions on issues related to RBI’s governance and the need to revisit the prompt corrective action norms for state-owned banks.The board could also discuss the issues before other subcommittees, including the capital framework of RBI. Das said it was heartening to note that inflation was in line with the central bank’s target and that the outlook looked benign. “Inflation targeting is an important function, which the RBI Act has mandated. It’s a mandatory part of RBI’s functioning. So that will remain very important," Das said, adding that the Act also mentions the importance of economic growth. “Maintenance of growth trajectory of Indian economy is also important." RBI kept its policy rates unchanged in the credit policy review last week and cut its inflation forecast for the rest of the fiscal, citing a sharp fall in crude oil prices and food “deflation".